Bambini Learning Group is a unique and holistic program. Their Reggio-Inspired philosophy and innovative approach to child care has made them a respected authority in the child care field. This page features some of the places where Bambini Learning Group has been featured. Executive Director, Fabiana Gunschnigg and Brand Manager, Krissia Gonzalez appeared with Mom, Pop & Tots Fair event organizer, Louise Reinich on Global News. They spoke about the fair as well as the unique program offered at Bambini Learning Group. 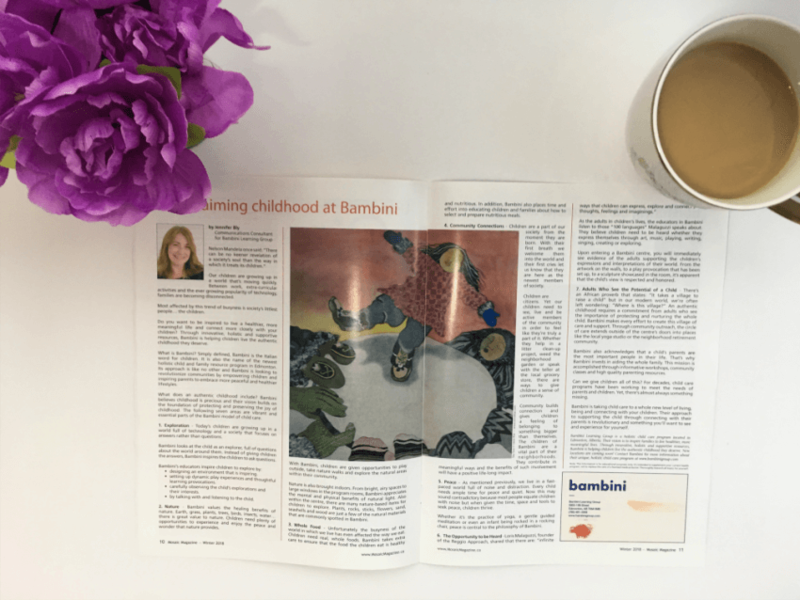 Bambini Learning Group appeared in a two-page article in Mosaic Magazine. This exclusive feature highlighted the unique facets of the programs offered at Bambini Learning Group. You can read the article in its entirety on the Mosaic Website. Bambini Learning Group is open to media interviews and requests. Please direct your media inquiries to Bambini’s Communications Consultant by completing the form below.